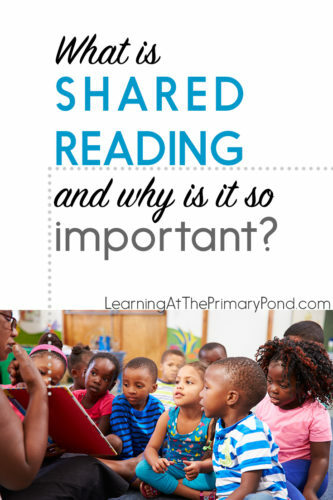 What Is Shared Reading, and Why Is It So Important? Once upon a time, I was co-teaching in a classroom, and we were re-doing the daily schedule. However, when it came time to actually implement the schedule, I noticed that something was missing from our literacy block. Sure, we had readalouds…word work…and plenty of guided reading. We could see all of our kids every day, because there were two of us teachers in the room! And that something was shared reading! Although we had planned for a shared reading experience through a daily morning message, it wasn’t quite enough. 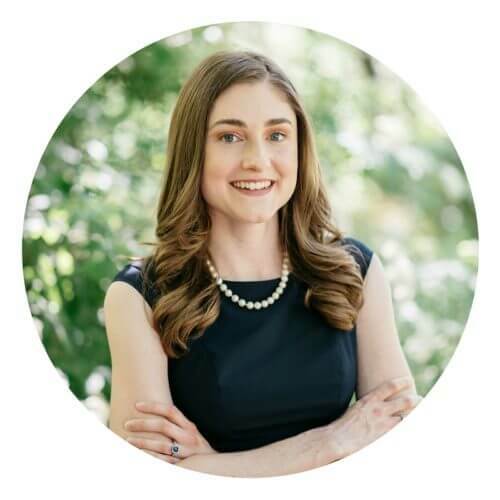 Our balanced literacy model felt unbalanced, and I could see how it was affecting our kids (they actually hadn’t had shared reading all year long). Monday – I introduce a story at guided reading level H to my students (most of my students are at a Level F or below). I briefly tell them about the story and then begin reading aloud. I don’t have my students read along with me yet, because they don’t know the words. I stop twice to model a decoding strategy for two words but otherwise keep the reading fluid. When students catch onto the pattern of the text, they began to choral read with me. After the text, I help my students briefly retell the story, and I ask a few comprehension questions. Tuesday – I bring back the same text and set a purpose for rereading (paying attention to word endings like -ing, -ed, etc.). We reread part of the text. This time, my students join in because they are more familiar with the story. I model how to cover up a word ending with my hand, read the base word, and then read the suffix. My students help me do this for a few other words in the story, but I let them take the lead and have 1-2 students come up to the front to model it for the group. We don’t get through the entire text, just the first half. Wednesday – We begin rereading where we left off on Tuesday. This time, we work on inferring. Before the lesson, I have marked certain sentences within the text. When we get to those sentences, I have my students explain what can be inferred from the sentence. Thursday – We reread the students’ favorite part of the text (they get to vote). We go back through that part and find words with long vowel spelling patterns. We make a chart of the patterns we find. Friday – I work with the students to decide on reading parts (different groups of students will read for different characters). I do a super quick review of how to make your reading voice match the ending punctuation. We reread the text in parts with a focus on fluency. Why Does Shared Reading Matter So Much? When we work with students during guided reading, we use texts that are a teeny bit harder than what they could read independently. Our students will likely get better at reading texts at that level. But if we only present texts to them at that level, how will they eventually be successful with texts that are more difficult? Well, we can prepare them to read harder texts through shared reading! The ideal shared reading text is more challenging than guided reading, but easier than the texts we use as readalouds. Shared reading matters so much because it guides students along in their journey through increasingly difficult texts. It prepares them for what’s coming next! Myth #1: Shared reading always involves a big book. Since my experience is mostly in primary, I do tend to think of big books when I think of shared reading. But shared reading can be done with so many different types of texts! You really just need your students to be able to see the words clearly enough to read them. You can display “regular” books under a document camera, or write a poem on chart paper, or even create a shared reading text with your students. Myth #2: You need a new book every day for shared reading. This probably sounds incredibly lazy 😂, but one of my favorite things about planning for shared reading is that you DON’T always need a new text each day! As long as you find a text that a) is engaging and enjoyable for students to read multiple times, and b) presents multiple teaching opportunities, you can absolutely read a shared reading text more than once. You simply read it for a different purpose each time! I’ll explore this idea further in future blog posts. Myth #3: Shared reading is only for primary students. Students need to see decoding, vocabulary, comprehension, and fluency strategies modeled throughout their school careers—and that doesn’t end when they leave primary! Shared reading also presents an opportunity to help kids successfully read and comprehend a text that might be a little too tricky for them to tackle on their own. Again, this need does not end in primary! 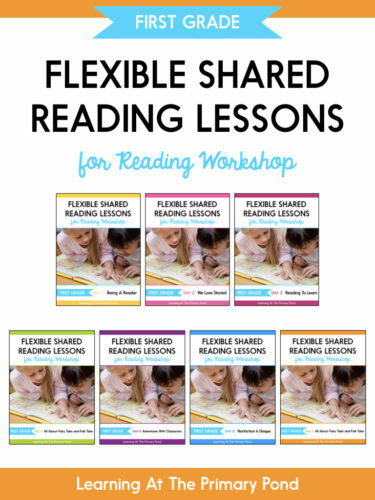 Get more guidance with shared reading! ← What does a Pre-A guided reading lesson look like? I’m so excited to read more about your shared reading blogs. This is something I really want to start for next year. When do you suggest you start this with back to school? What you have a wide range of reading levels in the classroom? Like students on levels H and some on levels N and O? I want to challenge them but would it be appropriate to choose books on levels P and Q? Hey Dronica!! At the beginning of the year, I teach routines and procedures but also dive right in to simple shared reading lessons. That is absolutely difficult with such a wide range of reading levels. In that case, I’d choose something in the middle (not P and Q – more like a K/L for the beginning of the year) but then try to address strategies that ALL (or most) students can use, regardless of reading level. This could be things like breaking words into chunks, specific comprehension strategies, vocabulary strategies, etc. Just to make sure that I am clear, Does shared reading happen in addition to my guided reading groups. Kinda like a mini whole group lesson? Do the text need to relate to what my guided reading is? Hi Lisa! I do shared reading in addition to guided reading groups, yes. Exactly like a whole group minilesson! If I can, we work on the same skill(s) during guided reading (for groups that need to work on the same shared reading skill). Typically the books are different, however. It’s nice to link the skill/strategy between shared reading and guided reading, but otherwise they can work separately. My biggest challenge with shared reading is finding and preparing engaging, appropriate texts m. Suggestions? I used poems written out in large Manila tagweight chart paper. Prep and storage have proven overwhelming. Hey Donna! Do you have a document camera / Ladibug by any chance? I use regular books under the document camera for many of my texts! This is great information Alison! Thank you for sharing! So glad this was helpful, Cathy!! Thanks for reading!! Thank you for always sharing! I love all that I learn from you! Thank you so much. I have been teaching 8 years and no one has turly explained guided reading like this. Love it. Look forward to the next blog. Will your resources be geared only for K-2? Or will you also include adaptations for Grade 3? Thanks. Never thought of doing this with my class. I will try this. Thank you. Hey Erika! In Journeys (which I’ve never taught before, so just wondering) do you have a time when you read the basal story together? That could be your shared reading time! When do you usually do shared reading with your students? What about informational text? The kids can’t read as characters. With the common core being so much more focused on info texts, can you give a weekly example of how you’d teach this? Do you ever have them turn and talk to each other during the text while you’re modeling? 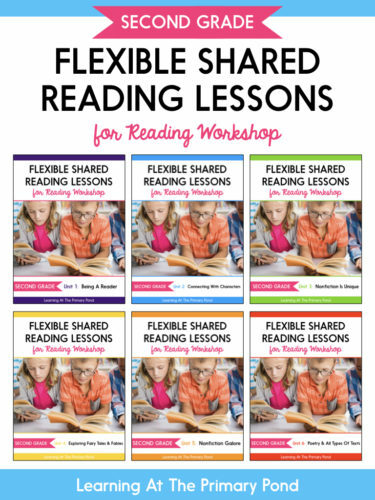 I have purchased your Readers Workshop curriculum and Reading and Writing Throughout the Year curriculum. How do you use both of these in the classroom? 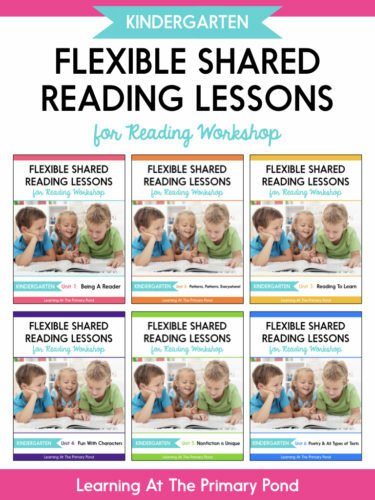 As school starts this upcoming year, I have prepared Lessons 1-11 from Readers Workshop but I am missing the Shared Reading I love to do so much with my class. When and How do I get both of those into my literacy block as well as guided reading-small group instruction while have a center rotation. I guess I need some guidance on how all of this implemented daily/weekly. Thank you for your quality work. Hi Jean! This post has some sample schedules for 2nd grade – does this help at al?